Last year the world was hit by a world wind from the Instant Pot, and this year the Ninja Foodi is ramping up speed! The Ninja Foodi is going to be the top foodi gift this holiday season on so many peoples wishlist! This new kitchen appliance is gaining a lot of buzz, for how versatile it is in the kitchen! 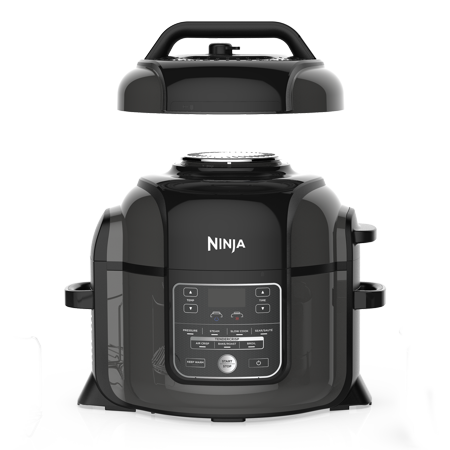 The Ninja Foodi is a pressure cooker and Air Fryer in one! You can get that quick cooking method from the pressure cooker and crispy texture from the Air Fryer element. So a tender and crispy option is available, which has won over so many who have tried this appliance. Easy to operate! Great for users who have used an Instant Pot, it has a similar system. Wants meals cooked quickly but still tender and flavorful. Looking for a crisp texture like fried food, but the Ninja Foodi doesn’t use all the oil in traditional frying. This appliance has a nice display window, so you can see exactly how long you have left and what’s going on! The at Fryer setting shuts off once the time runs out, so you don’t have to sit and babysit once it is done. It is essentially like 2 appliances in one! And Air Fryer and pressure cooker. Do I Need A Ninja Foodi? If you spend a lot of time in the kitchen, then maybe you do! I love my Air Fryer and my Instant Pot! I can cook chicken wings with that crispy coating in my Air Fryer and tender al dente pasta in my Instant Pot. If I knew there was a device that offered both techniques I would snag it right up. It saves you room in your kitchen to have a device that does it both! It’s something to consider. It is a little heavy, compared to other devices. Because of the Fryer element, you need to have it away from the wall a bit as hot air comes out the back when you use the Air Fryer setting. The power cord is slightly short, so you have to be close to an outlet to reach. The crisping lid is not removable. So when you use it as a pressure cooker the crisping lid stays upright, which can be slightly in the way. Even with a few minor drawbacks the quality of food people are making stands out over the flaws. From fresh and hot homemade dinner rolls to crispy wings or tenders, roasts, and more are able to be made in this Foodi. If you or someone you knows enjoys spending time in the kitchen, this might be the perfect holiday gift, birthday gift, or even just because. Like with everything there are tweaks we might want to make, but at the end of the day, this kitchen appliance is really winning people over. Do you own a Foodi?? Check out these recipes that you could make in your Foodi.